Today, the Mortimer & Mimi Levitt Foundation awarded $375,000 in matching grants to 15 nonprofits serving small to mid-sized towns and cities across America to produce free outdoor concerts, as part of the second annual Levitt AMP [Your City] Grant Awards. Reflecting the Levitt Foundation’s commitment to creative placemaking projects generating community support, once again the Foundation opened the AMP selection process to the public to choose the Top 25 Finalists. In July, the Levitt Foundation invited nonprofits, and municipalities partnering with a nonprofit, to submit proposals that would reflect the three goals of the Levitt AMP awards: Amplify community pride and the city’s unique character; enrich lives through the power of free, live Music; and illustrate the importance of vibrant public Places. Nonprofits that received the Levitt AMP grant in 2015 were eligible to reapply. The public voted on the submitted proposals over a four-week period in November, selecting their favorite projects online at levittamp.org. 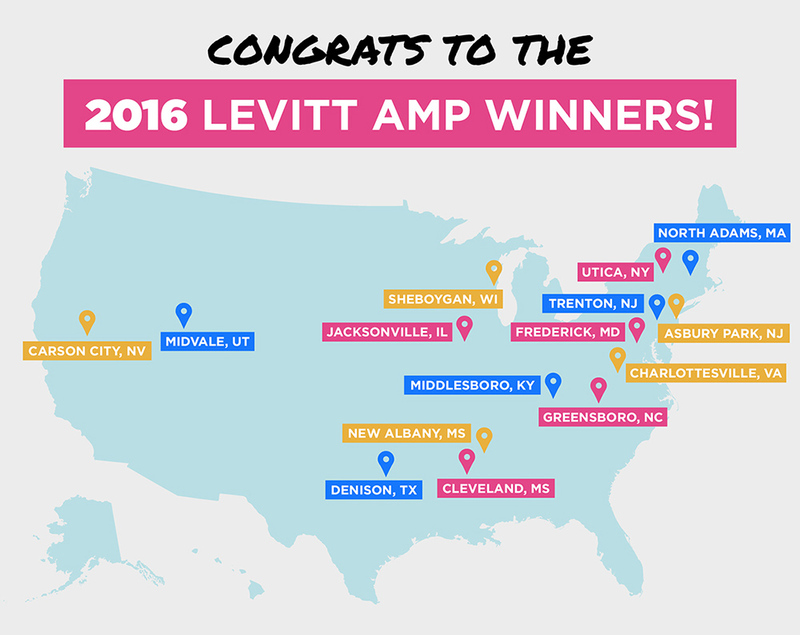 The 15 Levitt AMP winners hail from small towns like Asbury Park, N.J.; North Adams, Mass. ; Cleveland, Miss. ; Middlesboro, Ky.; Midvale, Utah; Jacksonville, Ill.; New Albany, Miss. ; and Denison, Texas; to mid-sized cities spanning the country including Greensboro, N.C.; Trenton, N.J.; Carson City, Nev.; Sheboygan, Wis.; Charlottesville, Va.; Utica, N.Y.; and Frederick, Md. Each winner will present 10 free concerts featuring a diverse lineup of high caliber entertainment in 2016 as part of the Levitt AMP Music Series, for a total of 150 free Levitt AMP concerts. Asbury Park Music Foundation will celebrate the city’s rich musical history with the launch of the Levitt AMP Asbury Park Music Series in Springwood Park—injecting new life into the first and only public park built on the city’s West side and giving all Asbury Park residents a welcoming place to come together. The Brewery Arts Center will elevate its existing summer concert series by bringing the Levitt AMP Carson City Music Series to the Minnesota Street Stage—transforming an underused corridor in the heart of Downtown Carson City’s Historic District into a vibrant gathering place for the surrounding community. WTJU radio station will continue to enliven IX Art Park, a recently launched public art park in the heart of Charlottesville’s Strategic Investment District near UVA, bringing together the city’s diverse populations and enriching community life through the Levitt AMP Charlottesville Music Series. Delta State University Foundation will once again present the Levitt AMP Cleveland Music Series to invigorate the underutilized Green Space on the Crosstie Walking Trail at College Street, honoring the Delta’s rich musical legacy in conjunction with the historic launch of the GRAMMY Museum Mississippi. Denison Main Street Inc. will further strengthen its city’s social and economic vitality with its second Levitt AMP Denison Music Series, elevating the existing Music on Main concert series in Heritage Park, a centrally located series that celebrates inclusivity, engagement and accessibility through music. The Downtown Frederick Partnership will present the returning Levitt AMP Frederick Music Series to continue activation of the underused Carroll Creek Park Amphitheater and celebrate local culture, providing residents with a place to gather and enjoy a diverse mix of talented artists. ArtsGreensboro will introduce residents to the newly renovated yet underused Jimmie I. Barber Park in East Greensboro through the Levitt AMP Greensboro Music Series, creating a new destination for bringing the city’s diverse community together to enjoy a broad range of musical styles. Jacksonville Main Street will revitalize the city’s historic central business district by presenting the Levitt AMP Jacksonville Music Series, breathing new life into the historically and culturally rich Central Park, once the vibrant center of downtown community life. Discover Downtown Middlesboro will build upon the momentum created during last summer’s Levitt AMP Middlesboro Music Series, which sparked the transformation of a vacant gravel lot into a vibrant gathering space that augmented the city’s community-driven revitalization of downtown. Midvale Arts Council will present the Levitt AMP Midvale Music Series in Midvale City Park to elevate the free summer concert series at the Midvale Outdoor Stage, building upon the city’s efforts to revitalize the heart of Midvale by providing all residents access to high quality performing arts. City of New Albany’s Tourism Department will present the Levitt AMP New Albany Music Series to give residents of all ages and backgrounds a reason to gather in the town’s recently renovated Park Along the River—inspiring a positive perception of this centrally-located yet underused park adjacent to the city’s downtown. MCLA Berkshire Cultural Resource Center will present the Levitt AMP North Adams Music Series to relaunch a newly renovated green space, Colegrove Park, as an inclusive community gathering place, in conjunction with the reopening of the adjacent Colegrove Park Elementary School. The John Michael Kohler Arts Center will build upon the success of last summer’s Levitt AMP Sheboygan Music Series to bring diverse audiences together and to further activate a recently opened public space in the city’s downtown core in need of rejuvenation. Trenton Downtown Association will once again present the Levitt AMP Trenton Music Series to enliven the unused and historic Capital Green public space, igniting community pride in the State’s Capital and encouraging residents to engage with the city’s rich cultural and historical offerings. The R2G Utica Urban Studio will present the Levitt AMP Utica Music Series to bring momentum to the city’s social, physical and financial resurgence—bringing together the city’s diverse local and refugee residents in Rutger Park to build a stronger, more unified community. In addition to the monetary award of $25K each in matching funds to produce the 10 free concerts, Levitt AMP grant recipients will also receive the Levitt AMP Toolkit containing valuable resources to help them successfully produce their concert series. Funding for the Levitt AMP [Your City] Grant Awards is made possible by the Mortimer & Mimi Levitt Foundation, a private family foundation.